To all of the attendees, exhibitors, presenters, commission leaders, and all of the staff and volunteers who made our Annual Conference happen, I owe a personal thank you. 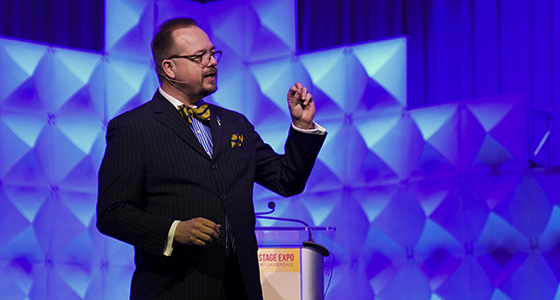 You’ve no doubt heard by now, it was the largest USITT Annual Conference & Stage Expo ever. We are incredibly proud of how the Conference has grown over the years. While that is important, what is more important is that we are striving to make it not bigger, but better. Bigger is a byproduct of striving to improve the expo experience, the educational offerings, and the overall attendee experience. Throughout the Conference, you heard people remind you to “rate your sessions.” So what do we do with that information? We share it with the leadership of the Conference Committee and the commissions. We take the feedback on topics and presenters, room set up, and session style and we try to use the constructive criticism to make improvements to the conference and to all USITT educational offerings. Soon you will be getting a survey about what you look for in a Conference city. Your input is vital as we work to find future host cities. We strive to take the Conference to all parts of the country, but there are realities of space and economics that make some things unfeasible. But your priorities can help us guide towards locations that allow the closest fit to the attendee wishes. The online and in person education that goes on throughout the year are impacted by your feedback. And we are always seeking to improve the experience for people from registration through closing. Whether it is an event for 16 or 6,000, the attendee experience matters. Of course, we try new things, and sometimes they don’t work. But as design and technology professionals, we have to do that every time we put something into a production. It is part of the discovery process as we are taught. But that discovery leads to finding new ways to do things, or ways never to do it again. And thank you for helping us make those discoveries. The Institute exists to bring people together and share knowledge. Thank you for your feedback and most of all, for your participation in USITT.